A great idea for a quick costume for any Halloween or Day of the Dead celebrations. 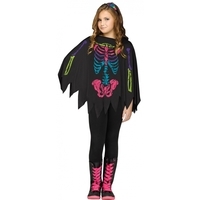 Poncho with colorful skeleton bone print. Leggings and shoes not included. One size fits child sizes from 4-14.